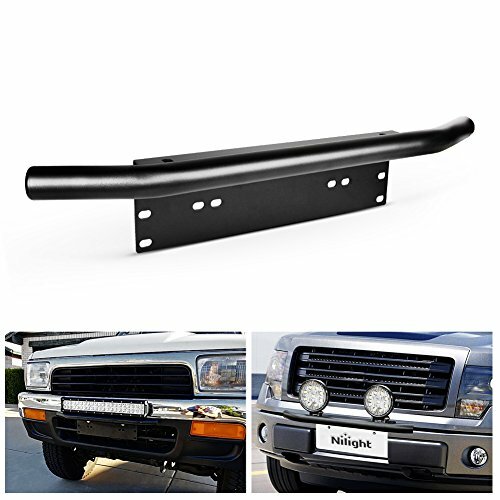 Nilight heavy-duty front bumper license plate mount bracket color: black, material: high-quality aluminum alloy great performance, sturdy and durable. Features multiple fixing points, installs behind number plate, easy installation suitable for most vehicles. Fit most cars, trucks, Pickups, SUV, Jeep, 4X4 with front license plate holes. Allow to add more auxiliary lights to front bumper without excess drilling/modification. Extra lighting and cool looking for your vehicle. Compatible with most lights/lamps with bottom mounting screws, some small size side mounted lights can be mounted by using extra bumper brackets.